Fall is knocking on the door, which allows you to stare at your walls and ceiling more. To many this is a license to clean up, clean out and freshen. Others hate this season as the ‘honey-do’ list increases from one chore to many chores. I laugh as I say this, because no matter what project I start, it always ends up creating work for my husband, who patiently waits till I am ready to hand over the task. Painting, admittedly is not one of my strong suits, as I am not tolerant enough and sometimes don’t like the detail of the brushes. Cut-ins to me are heartaches waiting to smudge my name on the wall. We lavishly lived out loud in this DIY and worked on redoing our plan walls in the den. I wanted lighter, brighter and welcoming, and we got it, when we used a great new paint we had never tried before, this is a DIY painting project! My husband and I conquer all DIY in the house, and we work together to get things done quickly and efficiently. One thing is for certain, if we can’t crank a project out in a planned time period, we know it won’t get done, we always make sure we place time aside to get it done. We work late nights and weekends around our work schedules. It is tough and it has to be well thought out because we allow time for snags as well(oh and we run into them!) My husband plans the timing, and I plan around the kids and their activities and life! Away we go…. This room is the Den and here were our Challenges! We had nail pops in a newly constructed home, we let them wait a few years before we tended to them, because more were to happen and they did. After waiting a few years it was time to redo the home office! We painted, cleaned the carpet and really cleaned out! We needed to choose color and decide how we wanted the room to look when it was done, and we were not changing much in the room, but we were keeping WHITE TRIM on all the woodwork, that was the only given! 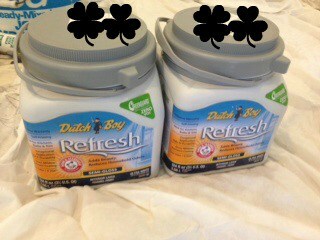 We had never used Dutch Boy Paint before, so this was going to be a change in supply. We thought it would be a great new find since it offered odor absorbing Arm & Hammer, was scrubbable, has low sheen and boasted good coverage. I love trying new things and sharing them with you! THE COLOR I CHOSE: I chose Kelsey Island Green which is the most GREEN I have ever placed in a room, it is a stronger color, but it plays nice against white baseboards and dark furniture! The walls overall were smooth, so we used a Light Sandpaper to prep them a bit further, as they had not been painted in a few years since the contractors had left. We wiped the walls free of any debris, and then once sanded we wiped the walls of sand paper debris. In addition all holes were filled and nail pops were filled and fixed. I do have to say, wall prep is my least favorite part of painting I am glad my husband does not mind that part! BASEBOARDS PREP – Keep Cost Low– Check this Frugal Tip! Baseboards are never fun, and painting them is so time consuming. In order to help my husband get done with this whole project(you know the one we are working on together, lol), I needed to do baseboard prep! This entails thought well in advance of the project because we use thin cardboard to paint the baseboards. I started saving pasta boxes that we eventually break down and ‘shove’ between the carpet and the baseboard. It is an easy do and when you are done, and the paint is dry, it all goes to recycles, so it is a very Green way to paint. In addition, we have these supplies readily available as we eat pasta regular, so waste no want not, we collect the cardboard and use it for projects! We began to make progress from transitioning white walls to Green Walls, but the process was slow. We had to make certain that all the rolling covered evenly and we were challenged because of lighting. The sun was in and out as we worked and even with other lights that we put in the room, it was not seamless or easy. It took 2 separate coats of paint to get the walls to the desired level of coverage. The paint has a nice sheen, a soft feel and looks great against the white. It livened the room up quite a bit, and it did not make the room smaller, which was what I had been concerned with when I chose the paint. Clean up was easy, as the paint did transition off of the brushes. The paint boasts that it is the only paint with Arm & Hammer® odor eliminating technology that will make a room beautiful and reduce odor at the same time. The coverage was seamless, it hid the white, our challenge was the light and watching our brush strokes and roller coating, the paint performed well! This is the first time we tried this brand and we were happy with the results. Can I say that odor absorbing Arm & Hammer is helping this room? Honestly, this room is far removed from any type of smells, so I did not choose this paint for that reason in this room and could not really tell you if it helps with odor absorbing. This was tricky, we initially started with masking tape, and then just said, there has to be an easier way. 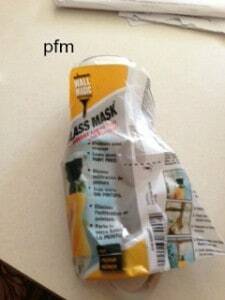 We attempted to track down Liquid Masking tape, this brand was Glass Mask. You basically paint onto the edges of the window panes closest to the wood work and then paint. Once you are done painting and it is all dry you have to remove this liquid masking stuff. It was not that easy, we used a razor blade in an attempt to not scratch the windows, and I still spent about 2 hours cleaning the glass and frames from the mess, overall , masking tape, would have been easier and made clean up much faster! This product did not save me time, and it did cost almost $10 for a bottle, I could have bought a few masking tapes for this and spent the same amount of time! Here if you want to see the Video of what it looked like on and off! Before and After. *Glass Mask DID NOT provide this product! We purchased this to test, use and let you know how it worked! I can tell you I would not use it again, as it was not advantageous to the process, it created more of a time-consuming mess. As for the room, I love how my room turned out, you can clearly see it is a Darker green, and it looks great against the woodwork and the furniture! It does feel smooth, it wipes up easily(I got pencil on it and one of the kids put hand-prints on the wall as well). I am glad I added color to a room! Would we use this brand again? I do think we would use this brand again, as long as the price is competitive, but I would not need the odor absorbing feature. We just wanted to try it out to see if we were missing anything from our normal brand. ! We have found at least that there is another brand out there that offers good coverage for home projects. Now we lavishly live life out loud testing new rooms and areas with this different Refreshing paint. We were very happy with the coverage and the nail pops remaining covered. Easy to apply, easy to clean up and a great true color, all inside this container of paint! As you know, the projects don’t end here and it is time to cover and freshen more walls, I wonder what brand we will be using next? These are my opinions, based on using the above listed products. Your opinions may differ! Nothing like a change of color to make things seem new! I think you did a FAB job! Better than me… I’m not so great with the DIY thing 🙂 And, great color choice by the way! ook like things came out great, even after some struggles…. We are awful at DIY projects and wish we could be less messy and more efficient at it! I like the idea of the cardboard as the liner between the baseboard and the floor. We always use newspaper and it moves around really easily. I think I will try your idea next time.